Summer has finally arrived! It's time to enjoy the great outdoors and food fresh from the grill. 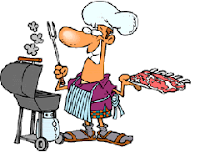 Join the Blue Flame Kitchen on July 26th for some new recipes as well as food safety advice. For more information on this session and our other offerings, please see the Human Resource Services, OHE July 2016 Lunch & Learn Bulletin and visit The Learning Shop to register.